The Helen A. Papaioanou Award for Extraordinary Service to Bates recognizes service to our college that is truly distinguished in both quantity and quality. Professor Emeritus of Physical Education William J. “Chick” Leahey Jr. ’52 received the award at the Annual Gathering of the Alumni Association on June 7, 2014. It was presented by President Clayton Spencer and Jennifer Lemkin Bouchard ’99, president of the Alumni Association. Leahey was joined by fellow award recipients Esther Rosenthal Mechler ’64 (Alumni Community Service Award), Christian Rogers ’04 and Katherine Papadonis Rogers ’04 (Distinguished Young Alumni Award), and, receiving Bates’ Best awards, Elizabeth Metz McNab ’64 and Victoria Wyeth ’01. As the Bates College baseball coach from 1955 to 1990, Chick Leahey taught hundreds of Bobcat ballplayers how to play at the collegiate level — how to field ground balls, throw strikes and hit line drives. But there was so much more to his service to our college. A member of this country’s Greatest Generation, Chick Leahey grew up in Lewiston during the Great Depression. One of the city’s best schoolboy athletes, he joined the Marines after graduating from Lewiston High School and served in the Pacific during World War II. Like many of his generation, Chick’s wartime experience has stayed in the past. But we can guess that the experience of being an 18-year-old Marine, serving alongside boys no older than the students he would later coach at Bates, touched him deeply. After the war, Chick took a swing at the big time in the New York Yankees’ farm system, but ahead of him in the Yankees’ pipeline were the likes of Jerry Coleman and Billy Martin. 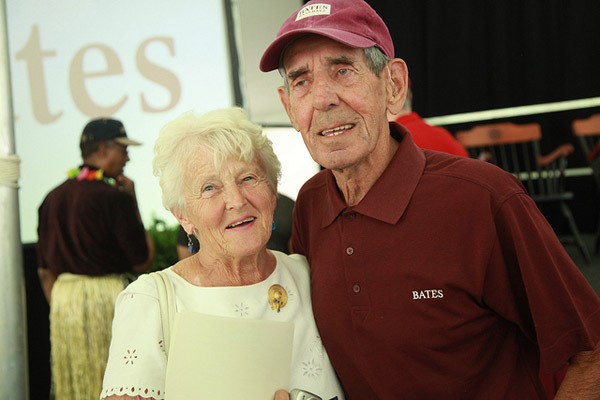 The GI Bill meant opportunity, so Chick decided to enter Bates in 1948, then returned in 1955 to coach baseball and build an extraordinary record of service to Bates and Bates students. In 36 seasons, Chick’s baseball teams won 300 games. Five times advancing to postseason play, Bates won the regional ECAC championship in 1976, about as far as a NESCAC team could go in those days. Today, the name Leahey still means great baseball — literally, because the Bates baseball diamond is named for Chick. Less a field of dreams, it is a real reminder that Chick has passed along the gifts of integrity and character to generations of Bates athletes. There is a multiplier effect of goodness that comes from playing college sports. Chick was fair and firm with his players, teaching them to compete fiercely yet honestly. He showed them that hard work, commitment and dedication were the ultimate transferable skills. That includes even the Maine slang used by Chick and his longtime assistant coach Bob Flynn. So if you ever attend a youth baseball game outside New England but hear the kids talk about “wicked” fastballs and “wicked” home runs, you might ask the coach if he played for Chick. There’s another former Bobcat, a pitcher, who does world-class research at Harvard Medical School, where he seeks to understand how genes affect complex motivated behaviors. When this researcher faces a vexing problem, he is urged on by a memory. His mind goes back to when he was on the mound, the team was in a jam and Chick would shout encouragement from the dugout. Chick, you have shown the way for countless Bates men across three generations. Your devotion to coaching has inspired pride and loyalty in all who have played for you, and you represent Bates’ values in every aspect of your life. You set a standard of excellence that lives on in every aspect of Bates College, and it is my distinct pleasure to recognize you with the Helen A. Papaioanou Award.